Thousands of WoodMaxx backhoes are in service today, and still going strong. The solid design and high quality components are unparalleled. Italian made control valves offer smooth and outstanding performance to our already robust WM-series backhoe attachments. New replaceable pivot joint bushing and an extreme duty gear pump are now standard equipment on all WoodMaxx PTO backhoe attachments. Please read below to find out more. The WoodMaxx backhoe attachments are a perfect combination of size, weight, and power. Light enough to move around, yet strong enough to get the tough jobs done. Some backhoe attachments boost heavier weight, but heavier is not always better. Additional unnecessary weight only adds stress to the frame of your tractor. WoodMaxx WM series backhoes attachments are manufactured using heavy formed q-235 (American standard ASTM A-36) structural steel plate, the strongest plate steel available. The pieces are CNC laser cut so that they fit together perfectly, and are then precisely welded. This fact combined with the structural design allows for the perfect combination of weight and rigidity. 3 SIZES TO CHOOSE FROM - FREE BUCKET INCLUDED! WoodMaxx offers WM-series backhoe attachments in three sizes to accommodate almost any category 1 tractor. Our WM-6600 with a maximum digging depth of 7', the WM-7600 with a maximum digging depth of 8' are compatible with tractors equipped with a cat-1 three-point hitch, and the WM-8600 that offers a full 9' digging depth is compatible with cat-1 three-point hitch and also some cat-2 three point hitches (please notice that a cat-2 top link is required to use this backhoe with a cat-2 three-point hitch. Let us know when ordering so that we can provide the correct top link). With the purchase of the WM-6600 you will receive a FREE 12" bucket. See below to add additional buckets. 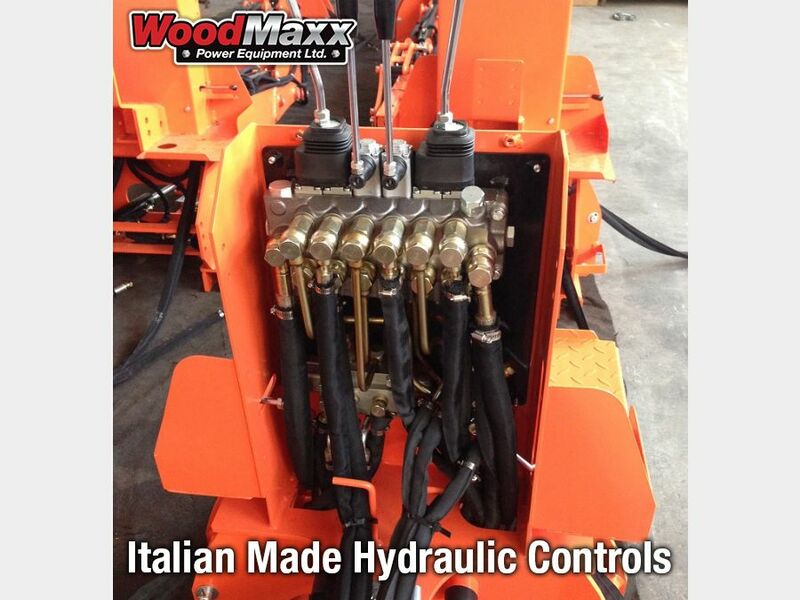 WoodMaxx WM-series backhoe attachments are now equipped with hydraulic control valves that are made in Italy by Hydro-control. Known for their high precision engineered control valves, Hydro-control designs and manufactures directional control valves for mobile applications and offers some of the most dependable products on the market. This is the highest quality hydraulic control valve available for a PTO backhoe attachments, and offers extremely smooth and reliable operation. Hydro-control has been involved in manufacturing hydraulic components since 1969, and has millions of products throughout the world in some of the most demanding applications. The hydraulic control valves on a backhoe attachments are the heart of the machine; this is why we chose Hydro-control. These control valves are second to none and offer extremely smooth operation for experienced operators, but are also very forgiving for novice operators. Over time the pivot points of a backhoe will wear and require pin replacement. This is evident when the various parts that make up the boom, dipper, and bucket become loose and rattle. Due to the high load application of the pivot points, this is a common wear item for backhoes and excavators. Not only does the pin wear out, but the pin boss will also experience wear, so simply replacing the pin does not return the backhoe to its original condition. 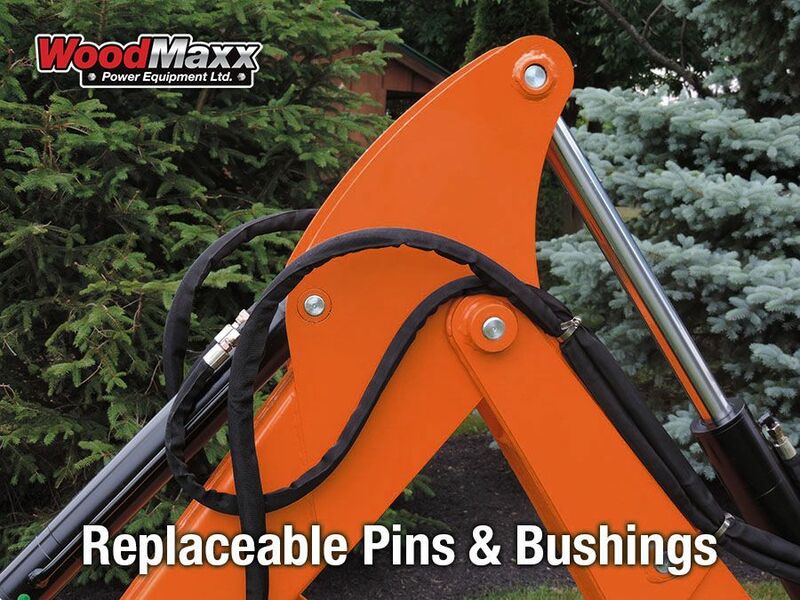 That is why WoodMaxx backhoes are manufactured with replaceable bushings that are pressed into the pin bosses. So when the time comes to replace the pins, you can also replace the bushings. This will return your backhoe to its former glory... You are spending a lot of money on an implement so this is a very important feature for sure. Without replaceable bushings there is no way to return the backhoe to its original condition and you will have to simply deal with a sloppy boom. This feature is usually reserved for standalone backhoes and excavators, but is standard equipment with any WoodMaxx PTO backhoe attachment. Additionally, WoodMaxx is the only manufacturer of PTO backhoes that offers this option, and an option that should not be overlooked when shopping for a backhoe attachment. 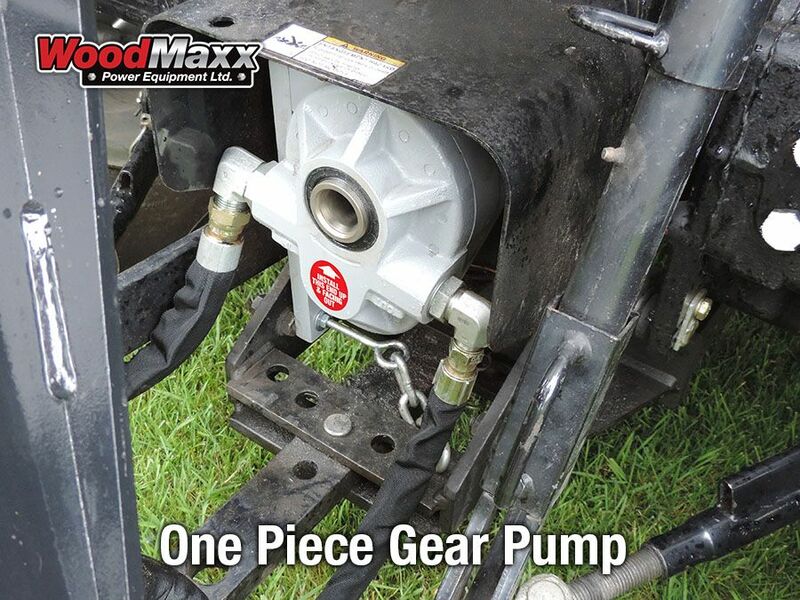 WoodMaxx backhoe attachments are equipped with an extremely reliable one-piece gear pump made from high strength aluminum center housing and cast iron end plates. These pumps are equipped with an internal spline and are made to slide right onto the 1-3/8" spline of your tractor. No need to add oil to these pumps since the lubrication is provided by the pumped hydraulic oils. Roller bearings and self-adjusting wear plates make these pumps far superior to any pump/gearbox combinations offered by our competitors that leak oil on the floor as soon as you disconnect the backhoe attachment from your tractor. Go ahead and compare, WoodMaxx is the only backhoe attachment manufacturer to offer such a robust pump. Commonly called "Cat" Or "John Deere" pattern controls. 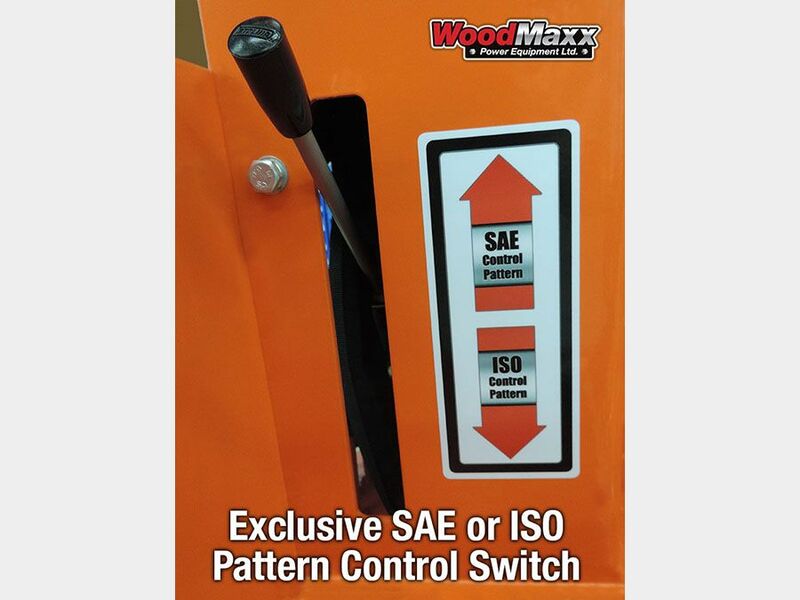 WoodMaxx backhoe attachments utilize a proprietary valve system that allows the user to change control patterns between SAE (Society of Automotive Engineers) Or ISO (International Organization For Standardization) with the flip of a switch. this is helpful if you are already accustomed to one pattern, or if there will be more than one operator using the same machine. The grapple thumb is incredibly handy for picking up rocks, tree limbs, and brush. The mechanical thumb requires the operator to position the thumb by lowering and inserting a pin to secure the thumb. The hydraulic thumb is simply adjusted from the operator's seat. The mechanical thumb now comes standard on each WM-series backhoe attachment. The Hydraulic Thumb upgrade is available for a limited time for only $495. The WoodMaxx backhoe ripper attachment is a single structural steel claw with a replaceable hardened steel tooth that focuses the force of the dig to a narrow point. The ripper is handy for breaking up rocky ground, tree roots, stumps, and brush. The ripper is available for only $440. 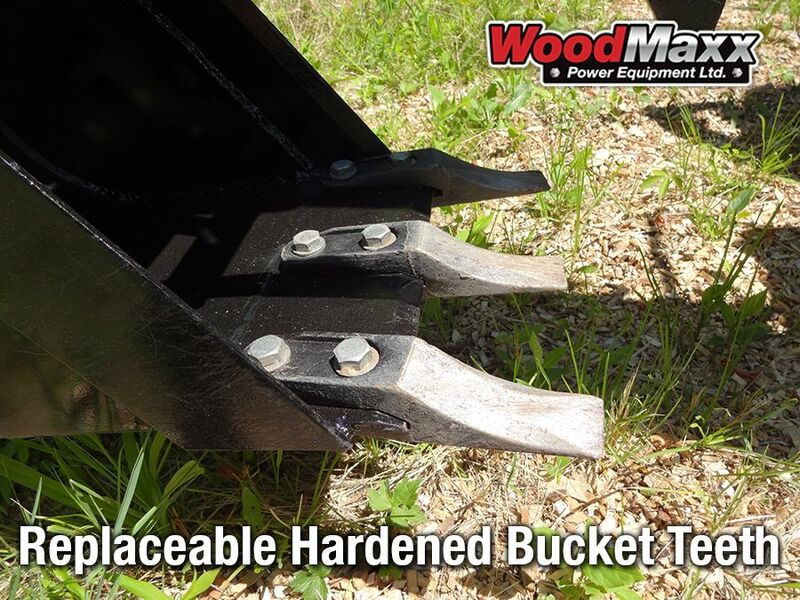 This optional attachment makes changing your backhoe bucket quick and easy. Fits all WoodMaxx backhoe attachments. Also works with ripper attachment. Only $269. Removable/replaceable rubber street pads on the stabilizer legs help reduce damage to the lawn, blacktop, and concrete. Standard equipment on WoodMaxx backhoe attachments. These hardened teeth will last a long time, but are a breeze to change when the time comes. 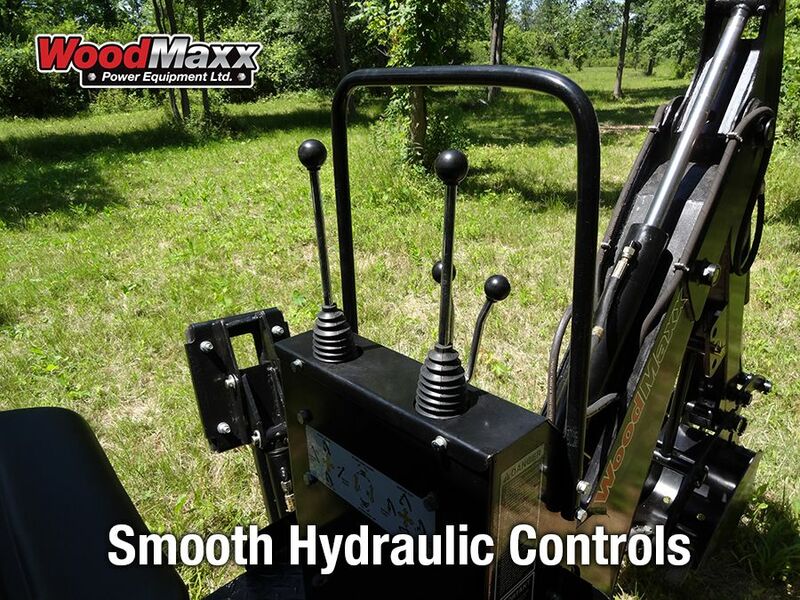 All of our WoodMaxx backhoe attachments for sale are equipped with a self-contained hydraulic pump and tank. No need for hydraulics from your tractor. This design is superior because it ensures the proper flow and pressure are achieved at 540 RPM PTO speed. This ensures that the hydraulic valves operate smoothly for the operator. Since all tractors put out different hydraulic flow and pressure, it is almost impossible to match a backhoe attachment to a tractor correctly. Over flow and pressure, or under flow and pressure is almost always encountered. This is not a problem with the WoodMaxx WM-series backhoe attachment. Also, the hydraulic pump mounts directly to the PTO spline of any category I tractor. No PTO shaft means no shaft sizing required, and no possibility of the shaft binding or jamming. This design also makes mating the backhoe attachment to the tractor easier, just attach the pump to the PTO, adjust the backhoe attachment height using the support legs and boom, back the tractor in, and attach the pins. This is not possible with backhoes that utilize a PTO shaft to power the pump. The boom on our WM series WoodMaxx allows for 180 degrees of swing from one side to another. This allows you to dig into those tight spots and dump the dirt where you want. 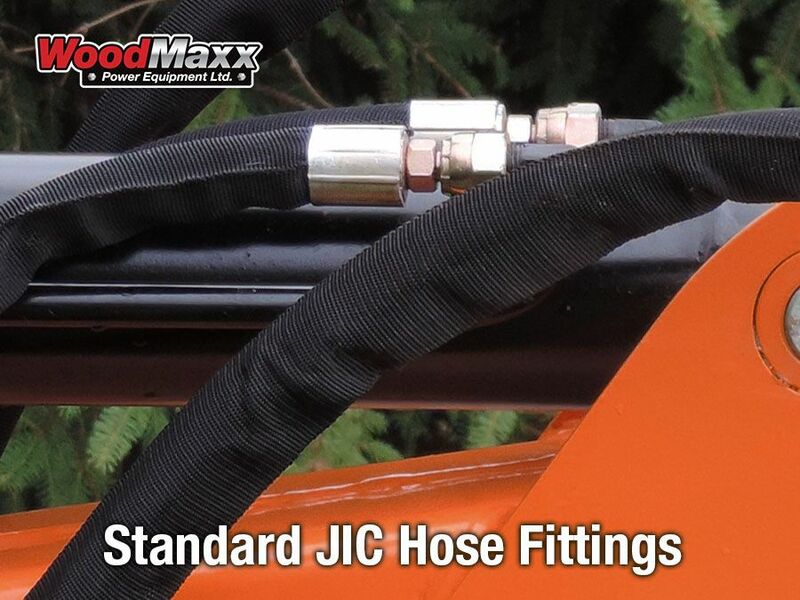 WoodMaxx WM series backhoe attachments utilize JIC (Joint Industrial Council) hose fittings and are rated for 5000 psi. For you this means that if you ever need to replace a hydraulic hose, that your local tractor supply or Napa can make hoses while you wait. JIC fittings are widely used in hydraulic fluid transfer and typically very easy to come by. No trying to chase down an adaptor because of mismatched threads. This is something that should not be overlooked when shopping for a backhoe attachment. They will all need a hose sooner or later! 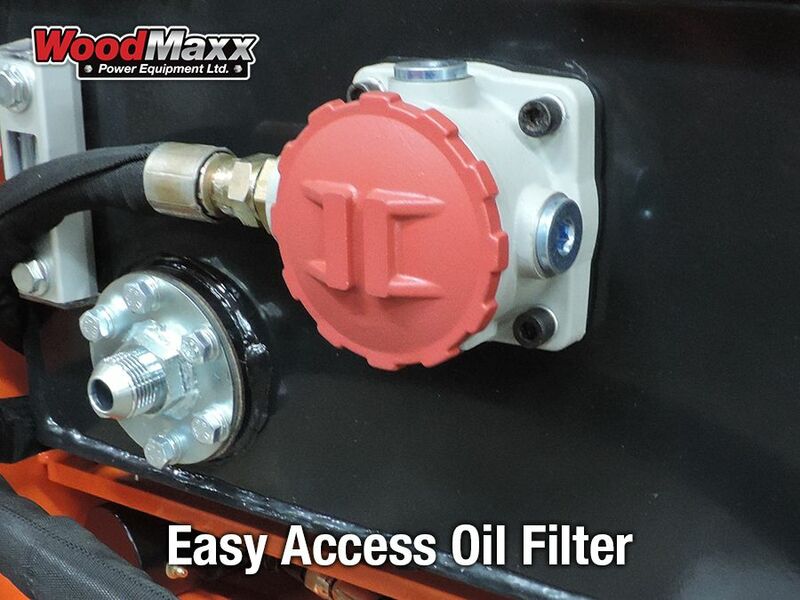 WoodMaxx WM series backhoe attachments utilize a cartridge type oil filter that is positioned directly inside the hydraulic oil tank through an easy access port. Positioning the filter in this location provides for greater protection from damage and ease of accessibility. These easy to change oil filters makes servicing your WM-series backhoes attachments breeze. WoodMaxx WM series backhoe attachments offer a superior powder coat finish that is baked onto the steel. This finish is thicker and much more durable than paint to keep your backhoe attachment free from rust and looking good for years. At WoodMaxx our service department is staffed with professional certified technicians that inspect each machine before it is shipped. This ensures that you get a trouble free machine from the get go. When you need technical help or parts, our courteous staff can help you get what you need from our fully stocked warehouse. We keep a full line of replacement parts, and guarantee that we can ship any part within 24 hours. All WoodMaxx equipment is built tough, and comes with an equally robust warranty for two years. Several colors are available (orange, yellow, red, and black) please request a color sample if shade matching is a concern. I ordered the backhoe last October 2018, but was told my model wouldn't be available until after the first of the year. True enough, it was ready to ship about 14 January 2019. I had it delivered to a local freight terminal as my road isn't suited for large trucks. I picked it up on the 18th. Assembly wasn't bad, and it was put to work the next day. I have never operated a backhoe, so there was a learning curve, but before long I had dug out a large pile of palmetto palm roots. This machine is tough and powerful. Today I dug out two oak tree stumps left from trees blown over in wind storms. I'm very pleased with the unit, and expect it will serve me well for many years. It's the best. I have it installed on my 2025r John Deere tractor, I also ordered a pto extension. Installed it in very little time. The shipping was fast (Newfoundland Canada). It works very well, Thanks, John. This backhoe far exceeds my expectations. I have a yanmar 424. I have rented the Cub Cadet back hoes on the 3200 series tractors. The speed they work at when revving high does not come close to the speed the WoodMaxx hoe works at on idle. I have removed about three dozen stumps in less than a week. The ripper is phenomenal start wide and go deep, keep clipping back the roots and you can pull any stump. So glad I didn't waste my money on a stump grinder. Using this and the chipper on 20 acres of overgrown lakefront property. Here are a couple of pictures to give you an idea. I received the backhoe in good shape. We have attached it to our Kubota and it is ready to use once the snow melts. We are very excited to put this machine to use! Thank you. Recently received my WM-6600 backhoe and I am totally impressed. The backhoe is very well built and precision is evident throughout all of it's construction. Another thing that impressed me and helped with my decision was the people at WoodMaxx who are always available for any questions one on one, responding quickly.Great company, great equipment!